June 15, 2018, at 9:45 a.m., Canadian legal history will be made. That is when the Supreme Court of Canada (SCC) will release its decisions concerning the Trinity Western University School of Law. There are two decisions that will be given. In December 2013, the Federation of the Law Societies of Canada accredited TWU. However, academics and equality rights activists demanded that the law societies reject their own Federation’s decision and open their own investigation of TWU. Three law societies accepted the challenge: the Nova Scotia Barristers’ Society; the Law Society of Upper Canada; and TWU’s home society – the Law Society of British Columbia. All the courts in BC and Nova Scotia ruled in favour of TWU. Only the Ontario courts ruled against TWU. The Nova Scotia Barristers’ Society did not appeal their loss to Supreme Court of Canada. TWU appealed its loss in Ontario; and the Law Society of BC appealed its loss to the SCC. The first case to be decided involved the Law Society of Upper Canada’s (LSUC) decision to refuse TWU accreditation because of TWU’s Community Covenant agreement. This code of conduct asks that students honour and follow the religious teachings of the university while a student. The university is a private Christian university. No one is required to attend. The Covenant holds that sexual intimacy is only permitted within a marriage between a man and a woman. TWU does not prohibit LGBTQ students. The Covenant requires that there be no discrimination or prejudice among its student body. A student will not be admitted unless the Covenant is signed. The benchers’ decision was found by the Ontario Divisional Court to be within its statutory mandate in acting in the public interest. The Ontario Court of Appeal agreed in a 3-0 decision. TWU appealed to the SCC. In April of 2014, the Law Society of British Columbia (LSBC) decided to accept the Federation’s decision. However, the law society members demanded that the decision be overturned. Finally, in the fall of 2014, the LSBC held a binding referendum amongst its members on whether to accept the Federation’s accreditation of TWU. The membership voted no. Then the LSBC rescinded its earlier decision and TWU was not accredited. TWU appealed to the BC Supreme Court and it found that the Law Society’s leaving the decision up to its member was not a proper way of carrying out its responsibilities and did not properly balance the Charter rights. The BC Court of Appeal in a 5-0 decision agreed with the lower court’s decision but made it very clear that on the balancing of the Charter rights, TWU’s right to religious freedom was to be respected and the school was to be accredited. The LSBC appealed to the SCC. 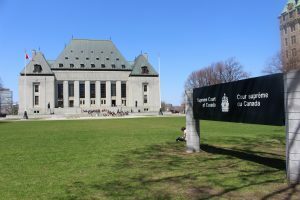 I have written extensively on this case because I am of the view that it is the most important religious freedom decision to come from the Supreme Court of Canada in decades. The reason I put so much on this case is because it is the first majour case that directly involves religious beliefs and practices flowing from the Court’s 2004 decision that authorized Parliaments’ redefinition of marriage in 2005. Now, we will know whether there is room in Canadian democracy for religious institutions that have refused to go along with Canadian society’s changing moral views on fundamental human life issues (FHLI), in this case marriage. Because a religious institution keeps the “old standard” of marriage, are we, as a society, willing to allow that institution to keep operating or must it be shut down because we cannot have dissonance between the old and the new? That is a fundamental question. Two very different views from two influential courts of appeal. Now the Supreme Court of Canada gets to decide between the two. What will it be? We wait.